A few hours later, after breakfast and a quick shower, the expedition is on its way. We’ll be spending at least four days in the car, just to reach the trailhead of our trek. In my mind I break the journey down in two. First the team has to get into Afghanistan. After that, having arranged the permits and transport, we have another two days of bone-rattling road ahead of us. Although the Afghan border closes at 4pm (still an hour early), apparently the border police on both sides have been waiting for us. The end of Ramadan is near and they wanted to close the border hours ago. We are likely to be the only travellers to cross today, so let’s see what the extra “fee” will be. The transit on the Tajik side goes smoothly. The Afghani border guards urge us to hurry, they just want to call it a day. My fellow tour leader Luca deals with the financial compensation of their extremely generous “extra service” in a backroom, and after a quick check in our duffle bags on alcohol and other contraband we are good to go. Enter Afghanistan!! The road into the Wakhan Corridor is terrible. I forgot about it (it’s been four years) and will forget about it again. But while on it, well, I’m not going to make it more romantic than it is: Dust, massive bumps and potholes and heat make it an arduous journey. However (and I will contradict myself from the previous sentence), moving with an average speed of 20km/h does have its benefits. 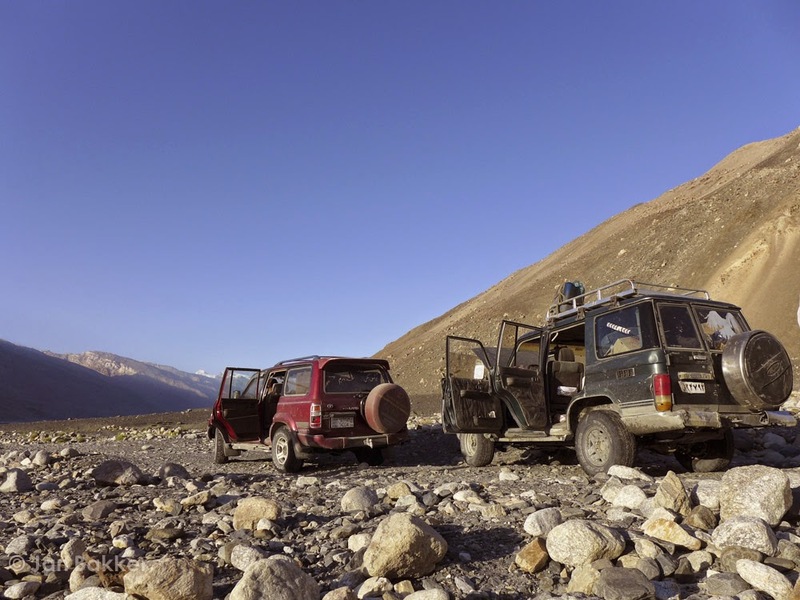 It enables us to catch a glimpse of the hidden valleys of the Hindu Kush. Tumbling glaciers reveal themselves for just one moment, letting the imagination wander off for the next hour. The slow pace allows us to take in the rhythm of daily life in the mud brick villages of the Wakhan. Women in beautiful red robes are working the land, a sight hard to imagine in contemporary Afghanistan. Introducing Malang. Malang is our jack of all trades in this part of the world. In 2009 he became the first Afghan to climb Afghanistan’s highest mountain, Noshaq (7492m). This earned him a true celebrity status, with coverage on national television and even in the international mainstream media. Locally he is deeply respected and we are honoured to have him on board of our expedition. As we progress eastwards, the river valley splits. The left fork keeps following the Tajik border. 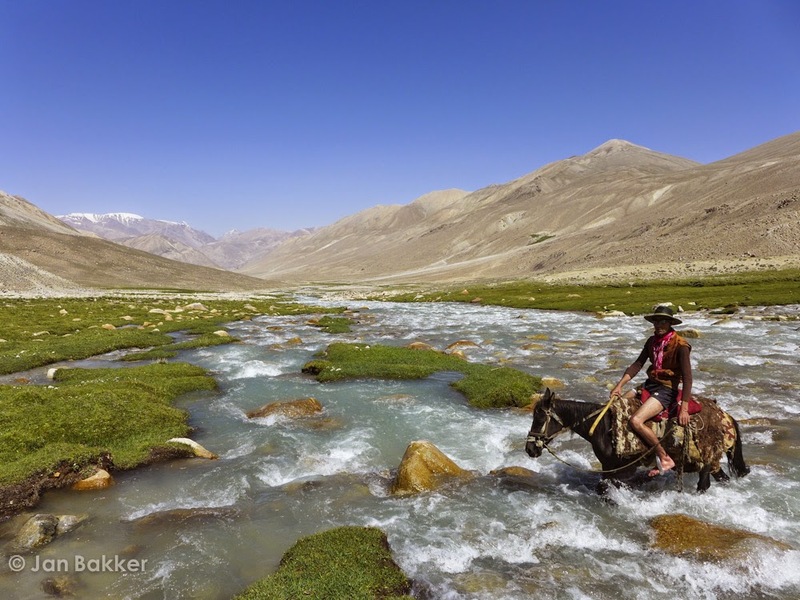 We take the right fork along the Wakhan river. 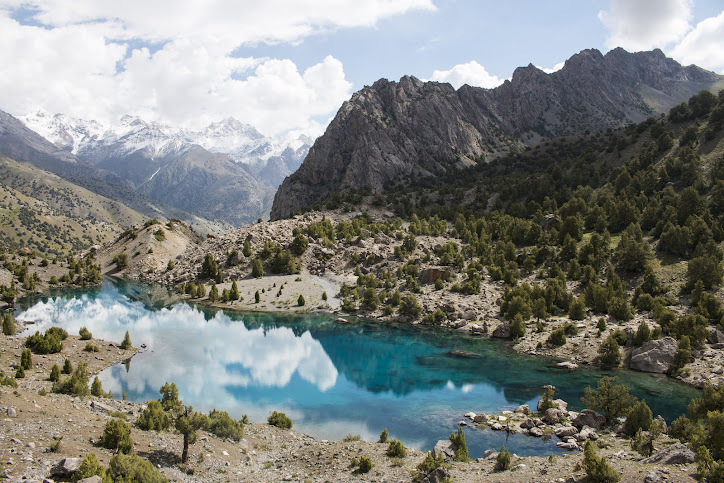 This valley is wedged between the mighty peaks of the Pamirs and the Hindu Kush. Today we aim to reach the final settlement in this valley, Sarhad-e-Broghil. But shortly after we are forced to rethink our plans. At the village of Sargaz the bridge is missing some vital parts for a safe crossing. We check the old road, and the existence of that bridge is justified. It's swallowed by the Wakhan River. The plan is to check early next morning, but deep down we all know we will have to change our itinerary. The river level is not going to drop 2 metres overnight… Lucky for us Sargaz is blessed with a hot spring, so our short term luxury needs are taken care of. 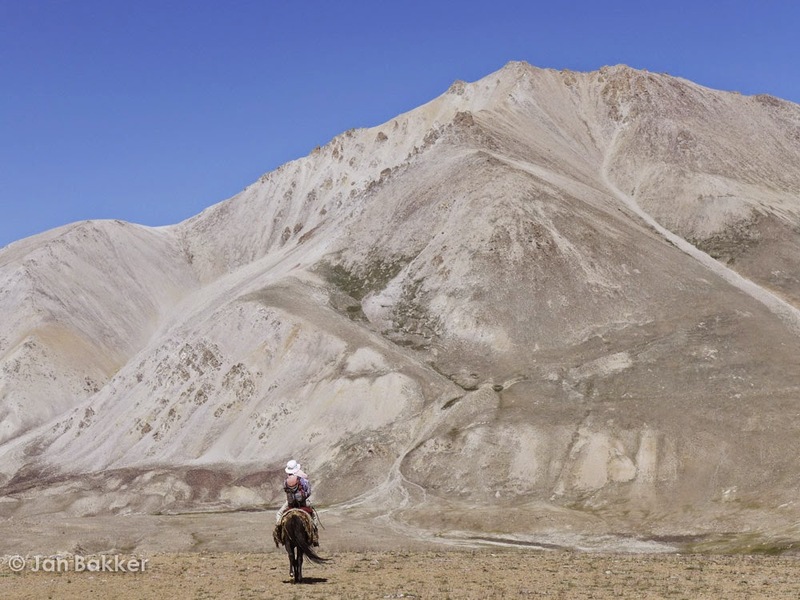 We decide to head back to Wuzed and approach the Big Pamir plateau from there. The Sargaz Pass is over 4800m and the team is not acclimatised enough. Our first day up the Wuzed Pass will be a 1000m ascend, which is also far from ideal. But with three nights at around 2900m we should manage. Malang already ordered our pack animals and Luca and I are taking care of the weighing of the cargo (892kg…!). With 17 yaks, 5 local guides and helpers and 12 team members the expedition is on its way. 10 minutes on the trail and we have to tackle the first and biggest river crossing of the entire route. The local horseman ferries the team across, in freezing cold and hip high water. He is the instant hero of the trip (and keeps that status throughout). On the map the ascend through the gorge up the Wuzed Pass (4425m) looks impossibly steep. In reality it’s not too bad. However, scaling over a thousand altimetres to reach the first aylaq (summer pasture) is a true challenge. The air is thin, dry and dusty and I hope we all cope with the altitude. After the 8km slog up, I look over my shoulder I realise this is why we are here. The spiky, glaciated peaks of the Hindu Kush dominate the horizon and I feel privileged to be in this desolate, beautiful place. Content I’m pitching my tent. The next day we reach the green, flat Wuzed Pass fairly quickly. It’s surrounded by 5000m+ peaks, but most of us don't need that reminder to be aware of the high altitude. The slightest effort leaves us breathless. 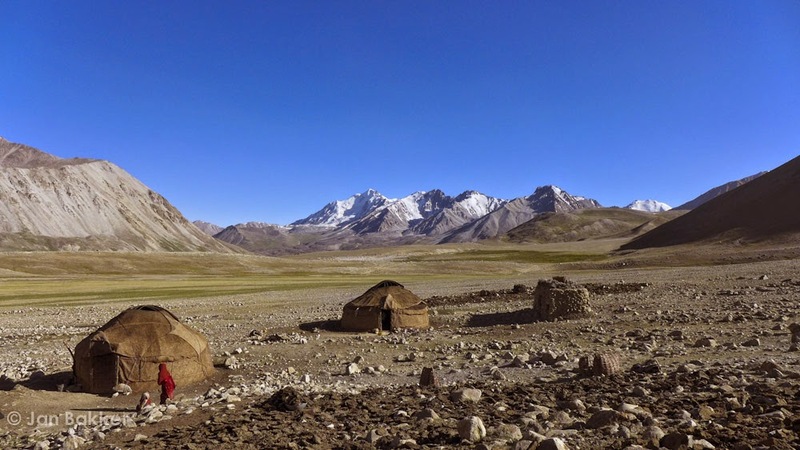 It's a short day and tonight we stay at the first Wakhi yurt settlement called Mulungdan at 4200m. This must be one of the best camp spots I have ever stayed. See the photograph below. 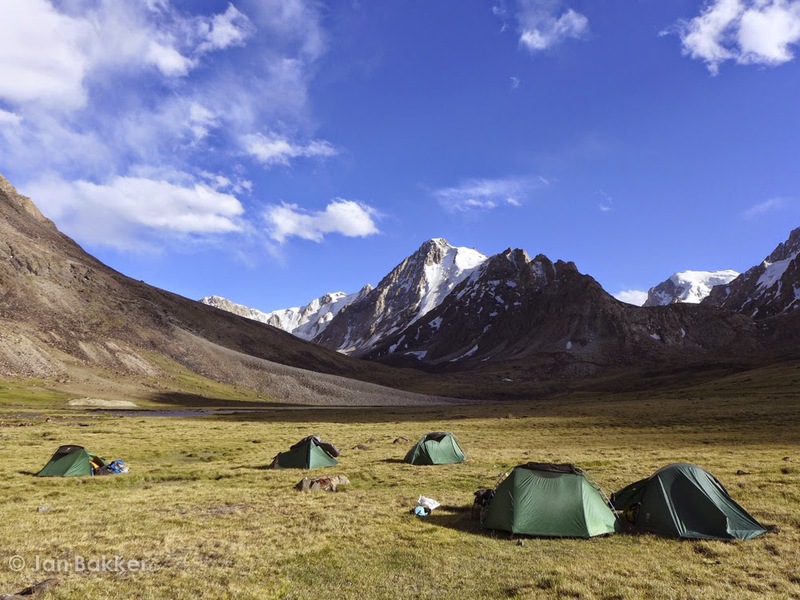 The next proper goal is climbing up the Big Pamir plateau. We pass numerous yurt settlements, all of them want their piece of the pie in the pack animal business. I agree with the idea to use the yaks and horses from different villages along the way, but having to load and offload the animals after two hours is not practical. We hope to use them next year. Another big river looms in the distance: the Shirkarga River. 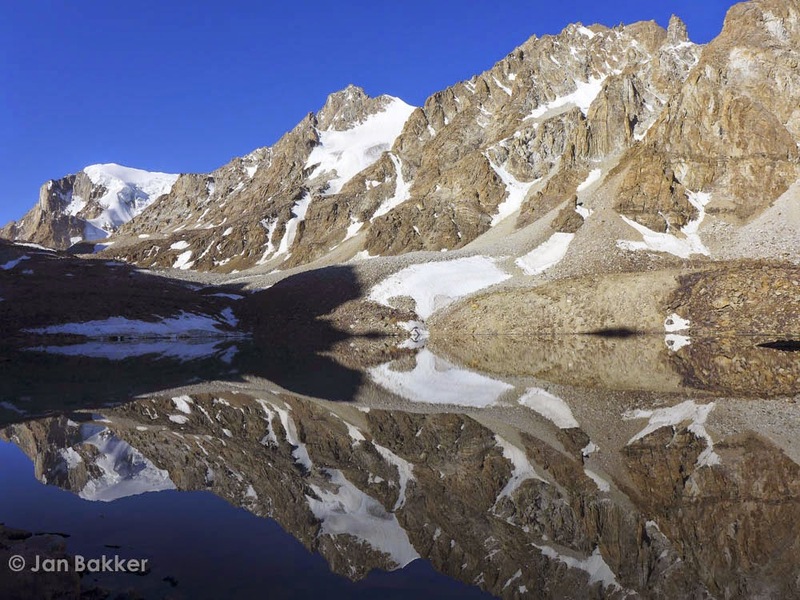 The valley is one of the main research areas for the Wildlife Conservation Society (WCS), and harbours Marco Polo sheep, Ibex and therefore also snow leopard. The murky, glacial stream is freezing cold but our yak taxis are ready to get us to the other side. Just 400 vertical metres separates the team and the entry to the Big Pamir. A couple of hours later as we reach the plateau we are looking over a vast high altitude desert with the Tajik Pamirs in north and Lake Zorkul somewhere in the east. The bad-e-Wakhan (120-day wind) pushes us to the next camp, Manjalang. The next three days on the plateau are tougher than I thought. There are no long climbs along this part of the route, but the subtle ups and downs do drain the energy levels slowly. Every day we cross a few rivers (all are possible to wade, but most choose yak or horse). 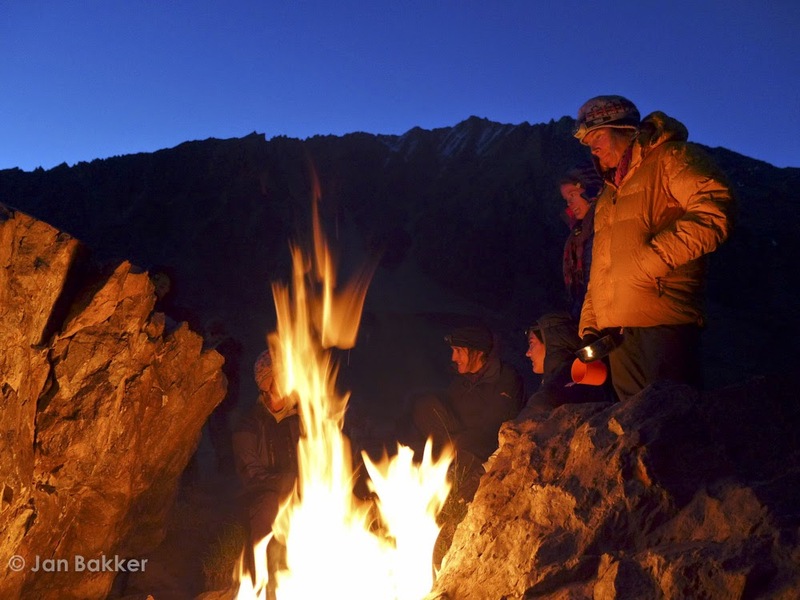 The team stays partly in tents, and a few nights in the village yurts. This part of the Wakhan is dry and desert like. Looking south the roof of the Big Pamir is visible with massive glaciers. I wonder how many of these peaks actually have been climbed. Now we're in Kyrgyz territory and horses seem to have taken over as pack animals. 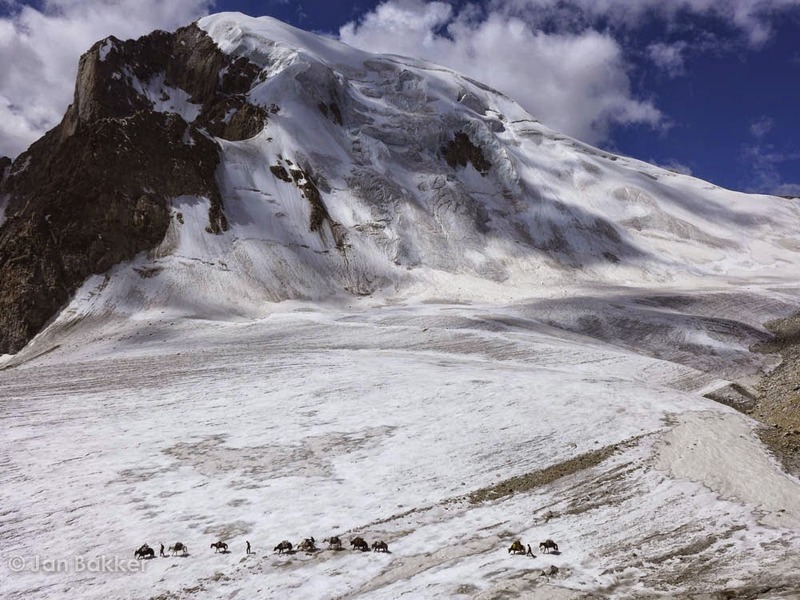 The highest point on this expedition is getting closer: the 4895m Showr Pass. A delay during an expedition is normally something undesirable. 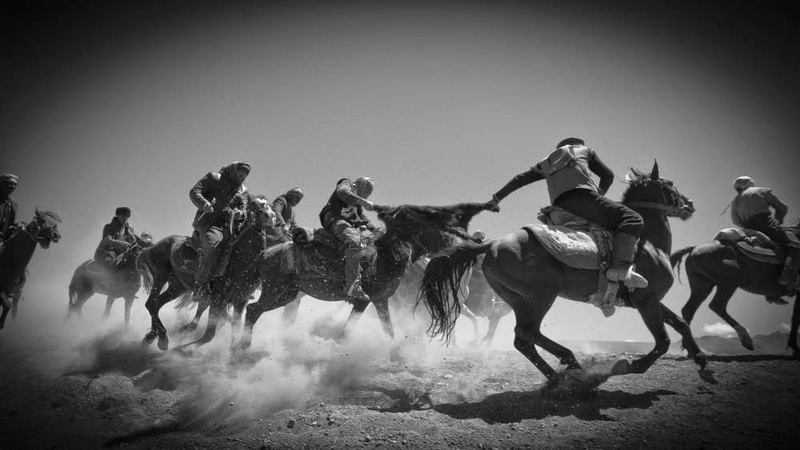 However, if a game of buzkashi is the reason, you can't complain really! We extend our stay in the settlement of Mula a bit longer. All the horses are participating in the buzkashi game, drawing players from the villages around Mula. For those who don't know this game: a couple of dozen horses and men play a game that aims to sink a dead headless goat's/sheep's corpse into a hole in the ground. It's each on their own, and it is rough. Horsemen try to steal the corpse from a competitor and score a point. There is no real pitch boundaries so occasionally the crowd has to run for their lives to avoid being trampled. We are lucky to bump into a buzkashi game. It is spectacular, thrilling and at times pretty scary as a spectator. The following day we are heading for the foot of the Showr Pass. After a false start and some re-negotiating with the Kyrgyz pack animal manager, we are on our way. The valley is fantastic and the pass is already visible. We make it a short day and pitch our tents at a beautiful aylaq with a blue-green mountain lake. Tonight we'll make an early start so we'll reach the top of the pass before it's too hot. Getting up at night to tackle a mountain pass or summit is magical: the anticipation and the incoming morning light are worth getting up for at 3am. The team huddles together at a yak dung fire and tries to down some breakfast (lucky for me no porridge today!). The approach to the pass seems impenetrable. The only thing you can see is massive boulders, scree and snow. But a little goat path winds its way all the way to the top, and again it's surprisingly easy going. 5 hours later we're on the top. I instantly fall in love with the nameless mountain on the side of the pass (gotta climb it!!). We spend an hour on the pass and prepare ourselves mentally for the long way down to Chapdara, our next camp. The terrain is easy, the views are out of this world but the distances are deceptive. It takes us almost another 8 hours to reach camp. The team is knackered and we buy a sheep to celebrate. Two days and a 4700m pass ahead of us to reach Sarhad-e-Broghil. The next day disaster strikes. 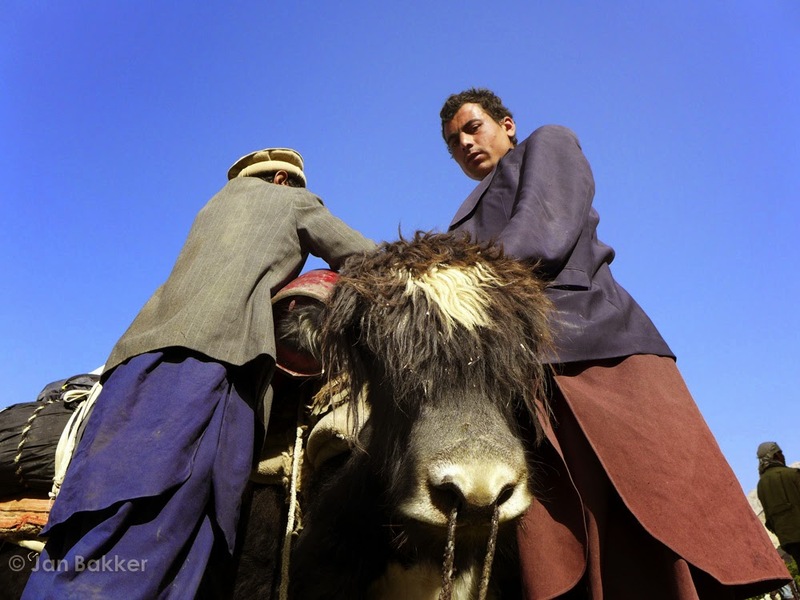 One of our local guys, Azim, gets stuck in one of the yak's stirrups. The yak gets a scare and starts running, dragging Azim on the rocky ground after him. Everybody is in shock. After 100 metres he's released from the stirrups but initially it looks very bad. He's still conscience, and we try to calm him down. With the next medical facility days away from where we are, this could be a very dangerous situation. We treat his wounds and hope he doesn't suffer any concussion. He seems to have escaped with minor injuries, but we keep an eye on him. The final day of the trek. Just 300 vertical metres and we're on the top of the last pass, the 4700m high Dara Bik Pass. Reaching the top this pass feels more of an achievement than getting up the Showr Pass. 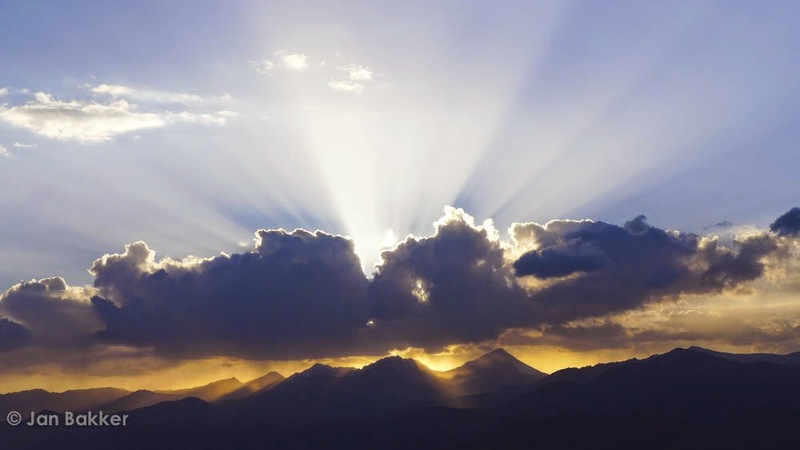 We watch the Hindu Kush, extending into Pakistan in awe. Now it's just down!! 1600 metres lower is Sarhad-e-Broghil. Apart from some tricky path sections it's smooth sailing all the way down. The hot spring and guesthouse are awaiting us!